Since I flooded everyone with Combine recaps for almost a full week, I decide to take a bit of a break before posting the “winners” and “losers.” Now we all know that no one can inherently lose the Combine, but they can hurt their stock with bad performances that don’t match what they did on tape. Working out poorly and causing yourself to fall in the draft is a loss to me. Jameis Winston & Marcus Mariota – Both of them separated themselves from the rest of the pack with their performances. Winston showed off his superior arm, while Mariota showed off his athleticism. Both interviewed extremely well and they are the clear-cut #1 and #2. Ali Marpet, OG, Hobart – Has continued to gain momentum as a prospect throughout the draft process. He may have only played Division 3 football, but he’s extremely athletic and held his own at the Senior Bowl. 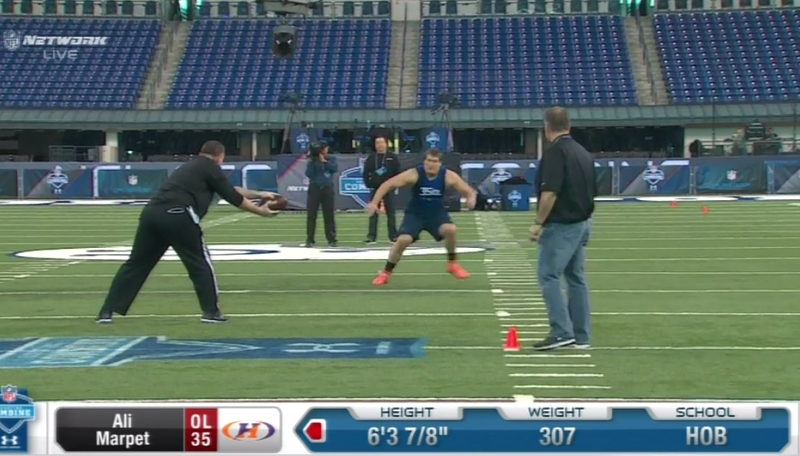 He looked every bit like a quality prospect during the drills at the Combine. Amari Cooper, WR, Alabama – Cooper was one of a few wide receivers with questions about his speed, but he answered them with a 4.42 40-yard dash. Most importantly though, he looked the most fluid running routes and going through drills of any of the receivers there and appeared to be the most sure-handed player. Dorial Green-Beckham, WR, Missouri – HUGE question marks as a person. I cannot emphasize that enough. Have absolutely no idea how he interviewed with teams during the week, but he had a great workout. Yes, he didn’t do very well lifting or showing explosiveness with a good vertical. But, he ran a great time in the 40 (4.49 at 6’5″ 237 lbs) and showed off his pure route-running skills and elite hands. Would be a sure-fire Top 15 pick if he hadn’t been arrested multiple times. Kevin White, WR, West Virginia – Probably the biggest winner of any of the offensive skilled position players. Kevin White had done some freaky things athletically during the season and in games and then he came to the Combine and tore it up. At 6’2″ 215 lbs he posted a 4.35 40-yard dash, 23 reps on the bench and a 36.5″ vertical. Chris Conley, WR, Georgia – Absolutely insane straight-line speed. Conley struggled in the side-to-side, agility drills, but that explosiveness is undeniable. Teams will be going back to check the tape on Conley after he posted a 4.35 40 with 18 reps on the bench, a 45″ vertical and a 11’7″ broad jump. Some crazy numbers out of the Georgia Bulldog. David Johnson, RB, UNI – Like Ali Marpet, the small school product has been climbing his way up draft boards ever since the Senior Bowl. He has some issues with his lateral quickness, but he tested very well for a bigger running back. At 6′ 224 lbs he ran a 4.50 40 with 25 reps on the bench and a 41.5″ vertical. Jeremy Langford, RB, MSU – Oddly enough Langford was the fastest running back at the Combine. Teams questioned how fast he actually was and posting a 4.42 40-yard dash time should just about cover that. All Of The Edge Rushers – Yes, this is a generalization, but every single edge rusher that tested at the Combine absolutely knocked it out of the park. 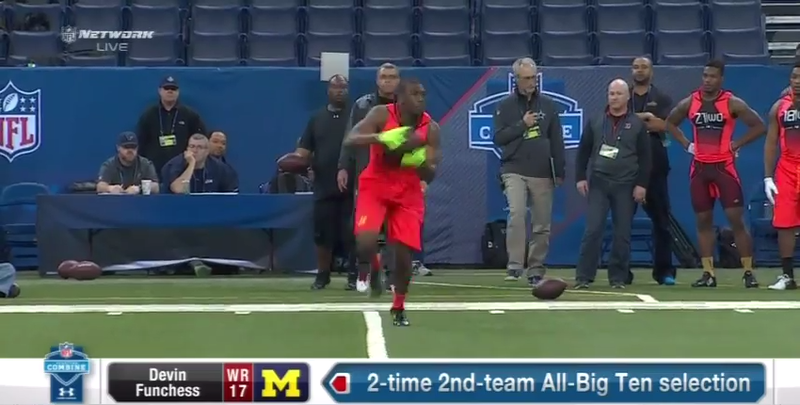 Dante Fowler, Vic Beasley, Randy Gregory, and Eli Harold, all had an incredible Combine. It’s a good year to need a pass rusher, that is for damn sure. Trae Waynes, CB, MSU – Michigan State is poised to have two cornerbacks go in the first round in consecutive years with Waynes Combine performance. He had questions about his speed and then he went and dropped a 4.31 40-yard dash time; silencing any doubters. Devin Funchess, WR, Michigan – Between the slow 40-yard dash time and constantly dropping passes during drills, the Michigan product did not help his cause as a borderline first round prospect. He may have put up 17 reps on the bench with a 38.5″ vertical and a 10’2″ broad jump, but a 4.7 40 eliminates him from the elite conversation. Sammie Coates, WR, Auburn – Like Funchess, Coates has major issues consistently catching the ball. Forget about his incredible physical traits, his hands and his route running issues are going to make him a project in the NFL. Any Tight End Not Named Maxx Williams – Other than Maxx Williams, none of the tight ends stood out as a potential star. There were some players that tested well, but nowhere near the type of athleticism most teams are looking for out of their tight end nowadays. All TCU Players, Especially Paul Dawson – I have no idea what is going on at TCU or where their players trained before the Combine, but they all tested horribly. I would say that Paul Dawson is the biggest loser of the group though. It’s one thing to test badly, it’s another to weigh in at 6′ 235 lbs, and then run a 4.93 40, put 21 reps on the bench, have a 28″ vertical and a 9’1″ broad jump. He looked stiff in all of the coverage drills and generally out-of-place. Brett Hundley and Bryce Petty – Both of them had an ample opportunity to solidify themselves as the third best quarterback in the Draft and neither of them did anything of note. They both still struggle to make the throws necessary for the next level, and whatever athleticism they have isn’t good enough to nullify their lack of pocket presence that they show on tape. This entry was posted in NFL and tagged 2015 NFL Scouting Combine, Ali Marpet, Amari Cooper, Brett Hundley, Bryce Petty, Chris Conley, David Johnson, Devin Funchess, Dorial Green-Beckham, Edge Rushers, Jameis Winston, Jeremy Langford, Kevin White, Marcus Mariota, Sammie Coates, Scouting Combine Winners & Losers, Tight Ends, Trae Waynes. Bookmark the permalink.